At the start of the season, perhaps the least popular person on the Mounds View girls’ tennis team was senior captain Taylor Trondson. So Trondson instilled a conditioning program the likes of which the Mustangs hadn’t experienced before. 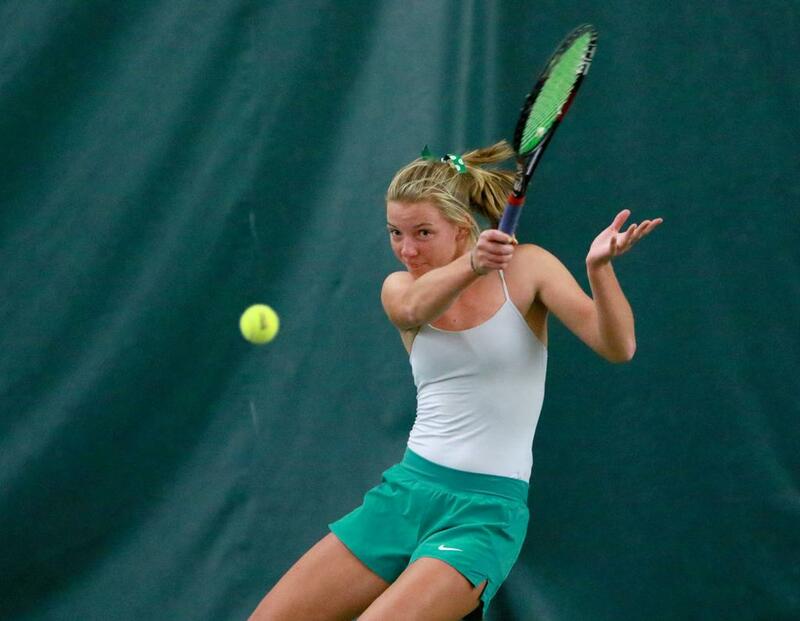 The hard work generated some grumbling, but it paid dividends Tuesday as Mounds View cruised past Eagan 5-2 in the Class 2A quarterfinals of the girls’ tennis state tournament. After losing all but three of its players from 2016, Mounds View spent 2017 learning the ins and out of high school tennis. That team had its share of fun, but Trondson believed that this season it was time to get serious. It wasn’t easy. The jump rope drills were a chore, as were repeated sprints. Endless foot-ladder drills brought groans. Now that Mounds View is among the last four teams vying for the Class 2A team title, Taylor Trondson’s tough drills are seen more favorably. Who knew being a No. 1 seed could be a disadvantage? Defending champion Edina occupied its customary spot atop the Class 2A bracket and the favorable quarterfinal matchup it brought. The Hornets took advantage, sweeping Lake Conference rival Wayzata 7-0 to advance to the semifinals on Wednesday. The disadvantage? It’s the third consecutive season that Edina played the 8 a.m. match. Not that it mattered. The defending Class 2A singles champion cruised past Wayzata’s Miriam Shteyman 6-1, 6-1 at No. 1 singles. It won’t get easier for Copeland, at least not for a while. Edina faces Mounds View at 8 a.m. Wednesday in a semifinal. Then she has an 8 a.m. match on Thursday in the first round of the singles tournament. In the other Class 2A quarterfinals, Minnetonka built on its 2017 state tournament appearance to beat Elk River 5-2. “We’re deeper and stronger and way better than we were last year,” said freshman Annika Elvestrom, who played No. 1 singles for the No. 2-seeded Skippers. Minnetonka will face No. 3 seed Rochester Mayo, which defeated St. Cloud Tech 5-2. St. James, a 5-2 winner over East Grand Forks on Tuesday, will play Litchfield in the first Class 1A semifinal on Wednesday. Litchfield defeated Osakis 7-0. The other semifinal will pit Rochester Lourdes, a 5-2 victor over Jordan, against three-time defending champion Blake, which defeated Virginia 6-1.